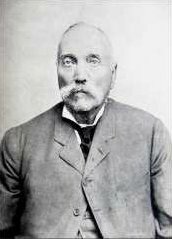 Marthinus Wessel Pretorius (17 September 1819 – 19 May 1901) was the first president of the South African Republic, and also compiled the constitution of the Republic. After the death of his father, the Voortrekker leader Andries Pretorius, in 1853, he was appointed as the Commandant-General of the ZAR (South African Republic) and moved from his farm Kalkheuwel, near Broederstroom, to the city of Potchefstroom. He was the last Head of State of Potchefstroom between 1853 and 1856. He was a South African Freemason. In an endeavor to establish a new town, he bought two farms named Elandspoort and Daspoort between 1854 and 1855, on which he founded the city of Pretoria in 1855. Ds. van der Hoff originally named the first church congregation in this area Pretoria Philadelphia (Pretorius Friendship), in honor of Pretorius' father. Later, the town took on the shortened name of Pretoria. Five years later the capital of the ZAR (Zuid-Afrikaansche Republiek or South African Republic in English) was moved from Potchefstroom to Pretoria. Wikimedia Commons has media related to Marthinus Wessel Pretorius. Pretorius served as the first president of the South African Republic from 1857 to 1860. However, in 1859, in an effort to create closer bonds of relationship with the Orange Free State, he simultaneously held the office of State President of the Orange Free State and that of president of the South African Republic. This however created tension in Transvaal and he resigned the presidency of the South African Republic in 1860. After serving in the presidency of the Orange Free State until 1863, Pretorius was reelected as president of the South African Republic in 1864 and served a second term until 1871. Pretorius served a third term as joint head of state (triumvirate) of the South African Republic between 1880 and 1883. He died on 19 May 1901 at Potchefstroom. ^ a b c d e Chisholm, Hugh, ed. (1911). "Pretorius § Marthinus Pretorius" . Encyclopædia Britannica. 22 (11th ed.). Cambridge University Press. pp. 310–311. ^ Tucker, M. (1 August 2016). "The (secret) story that started with Piet Retief". Zoutpanberger newspaper. Retrieved 17 September 2018. This page was last edited on 22 February 2019, at 19:32 (UTC).